We are still waiting for Bed, Bath & Beyond to officially release Black Friday ad for 2019 — More details are coming any time now so just hang in there just a little bit longer. But what can you expect? Let’s take a look. If this year’s sale is anything like what they offered these last few years in a row, you can expect BB&B to offer another 20% off storewide coupon along with a number of featured early-bird doorbuster deals (everything from Dyson vacuums to Keurig brewers are typically included). You can scroll down the page to see some of the offers from last year to get a general sense as to the types of deals they like to run. We’ll be posting updates here as they come in — Check back again soon or signup to our newsletter to stay up to date. 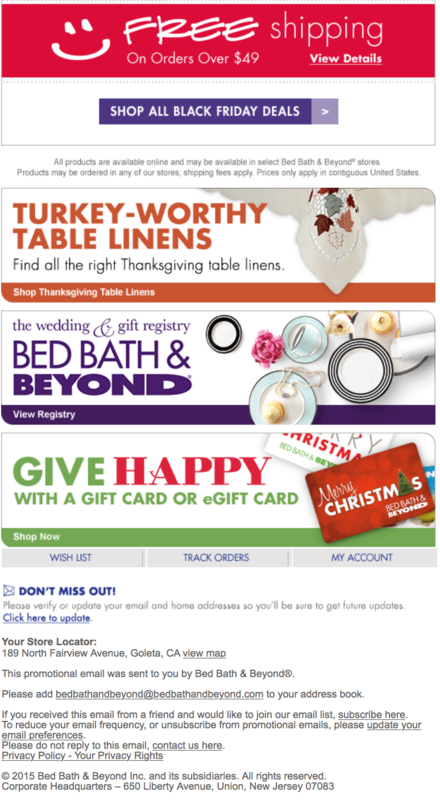 What do you plan on getting at Bed, Bath & Beyond’s sale this Thanksgiving weekend? Leave your comments at the bottom of this page. We’d love to hear from you! Updated on Friday November 16, 2018: With exactly one week left to go until Black Friday, we just received a copy of Bed Bath & Beyond’s Black Friday ad! There’s only 4 pages this year — It’s posted in full down below. You’ll be able to shop bedbathandbeyond.com all day on Thanksgiving (stores are closed that day) and get 20% off your entire purchase. Free shipping is also included on all purchases of just $19 or more. You’ll get the same deal in stores the next day on Black Friday, you just have to come in and check out between 6:00AM and Noon in order to get it. The full offer terms can be found on the 4th page of the ad. Happy bargain hunting! Updated on Tuesday, November 14, 2017: Bed, Bath & Beyond’s Black Friday 2017 ad is here! We’ve posted all 4 pages below — Check it out! 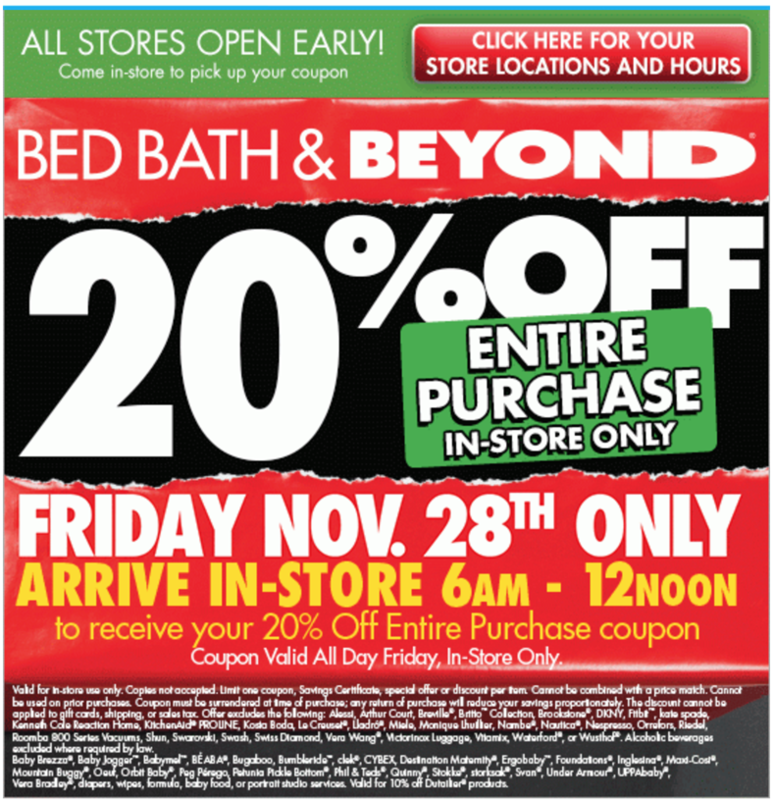 Just as we’ve come to expect from Bed, Bath & Beyond, they are offering us 20% off our entire purchase made on Black Friday between 6:00AM and Noon (that’s on Nov. 24th). Or you can pick up the deal early on their site starting on Thanksgiving day (and get free shipping too!) but you’ll need to register your email address with them to get the coupon code. As always, they have a few pages worth of doorbuster deals. That includes several Dyson vacuums, an iRobot Roomba, and a Keurig coffee maker to name a few. Obviously these deals will sell out quickly so be sure to make it there early if one of the items in the flyer is on your shopping list. Updated November 20, 2016: Black Friday is a few days away but you’ll already be able to shop Bed, Bath & Beyond’s sale online today! You can find the Black Friday ad posted down below with all the details. 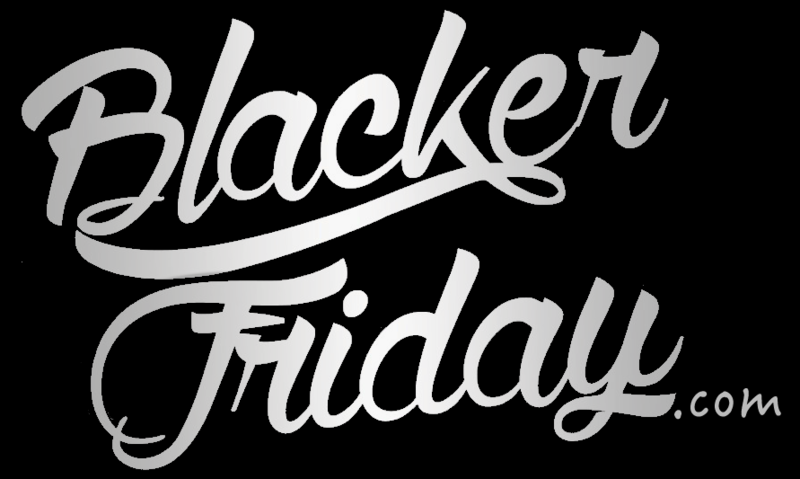 If you prefer to shop in-store, then the sale begins at 6:00AM when they open on Black Friday (that’s Nov. 25th). If you make it in before noon, then you’ll be given a coupon to save 20% on your entire purchase (the coupon will be valid all day). It’s Sunday and you’re probably just taking it easy before the the long upcoming Thanksgiving weekend and all the shopping that’s gong to come with it. However, if you want to get a head start before the crowds, Bed Bath and Beyond just launched their Black Friday sale early on their site for online shoppers. It’ll run from today all the way through Sunday November 29, 2015 and includes storewide free shipping on orders of $49.00 or more. Then you can expect to see some separate deals launch on Cyber Monday. If you prefer to go in-store, then be on the lookout for their offers to begin 6:00am on Friday morning. 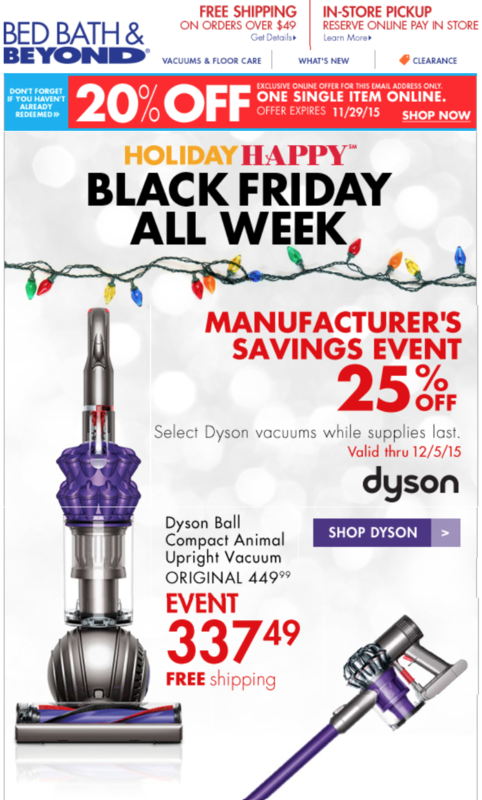 This year they are highlighting deals on Dyson vacuums – It seems to be a popular item this year among retailers. Starting now, Bed Bath and Beyond is cutting prices by 25% off. 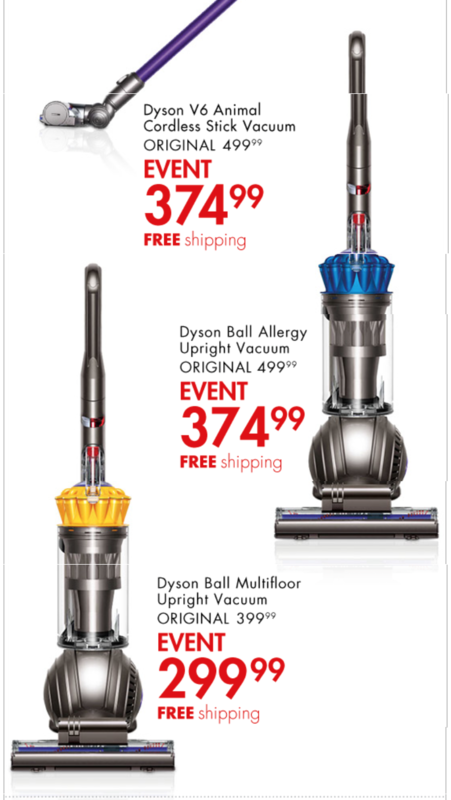 That includes the Dyson Ball Compact Animal Upright on sale for $337.49, the Dyson V6 Animal Cordless Stick for $374.99, and the Dyson Ball Allergy Upright for $374.99. All these monsters will also ship out to you for free. There are a ton of different things on sale as well so recommend that you see the full details posted on their site. Here this year’s flyer with the sale highlights: page 1, 2, 3. Updated November 27, 2014: Bed, Bath & Beyond just announced their 2014 Black Friday deals. This year all people who make it in-store between 6:00am and noon on Friday will receive a 20% off store-wide coupon to use on your entire purchase (good for the entire day, however some items may be excluded). Then over the weekend you’ll be able to pick up exclusive online deals that last through Cyber Monday. See the full offer details posted on this year’s flyer. Search for the nearest Bed, Bath & Beyond store in your neighborhood. If you have order related questions or need product return assistance then you can contact Bed Bath & Beyond Customer Service by phone at 1-800-462-3966 or email at customer.service@bedbath.com.